This month the hills and fields of Pontelandolfo are a bustle of olive picking activity. Tis the season to make that luscious green-yellow oil that the Sannio Hills are known for. Our village is chock full of ancient Ortice olive groves. For generations families have been harvesting their olives and either pressing the oil themselves or since the dawning of the 1900’s taking them to our local Frantoio Oleario Rinaldi – the olive oil mill owned by the Rinaldi family. Started by Giovanni Rinaldi, the oil mill has been managed by a Rinaldi for generations. Today’s managing director is Rocco Rinaldi. His sons Gianfranco and Sergio play active roles. The other role of Gianfranco’s is that of the mayor – sindaco – of Pontelandolfo. Sergio is a professional taster certified by the National Organization of Olive Oil Tasters in Italy. My New Jersey tasters aren’t certified but love the heady aroma and flavor of Rinaldi’s Vantera brand oil. I had a case of Vantera – sent to New Jersey just in time for last Christmas. Today, one of the recipients asked if Santa’s Elves were shipping another case over this year. Hmmm, I wonder if she has been naughty or nice? We are truly oil spoiled. Folks in Pontelandolfo who make their own oil, often store it in centuries old stone cisterns or vats. My happy oil dance just spins out of control when my pal Nicola takes the lid off his vat and scoops his fresh oil into a jar for me. YUMMY! My first thought was to tell you all about how this great oil is made through a cold milling process. The oil is extracted through a “superdecanter” in the low-temperature, continuous plant. Are you “jonesing” for a taste of our hometown olive oil? Taste some during our 2018 Cooking in the Kitchens of Pontelandolfo sessions for adventuresome cooks! October 31, 2016 October 31, 2016 by midgeguerrera, posted in Food - Eating In and Out! Sitting on the train between Naples and Milan, I was feeling sad about leaving Pontelandolfo when the elfin face of Zia Vittoria flashed across the screen of my brain. She was waving a plate of stuffed melanzane in front of my 8:00 AM – been on the road since 5:30 AM – hungry face. Now I see the train staff coming down the aisle with our early morning caffe and snacks so I know Zia Vittoria is a mirage. Since train food – even in prima class is even worse than airplane food, let’s go with my mirage. 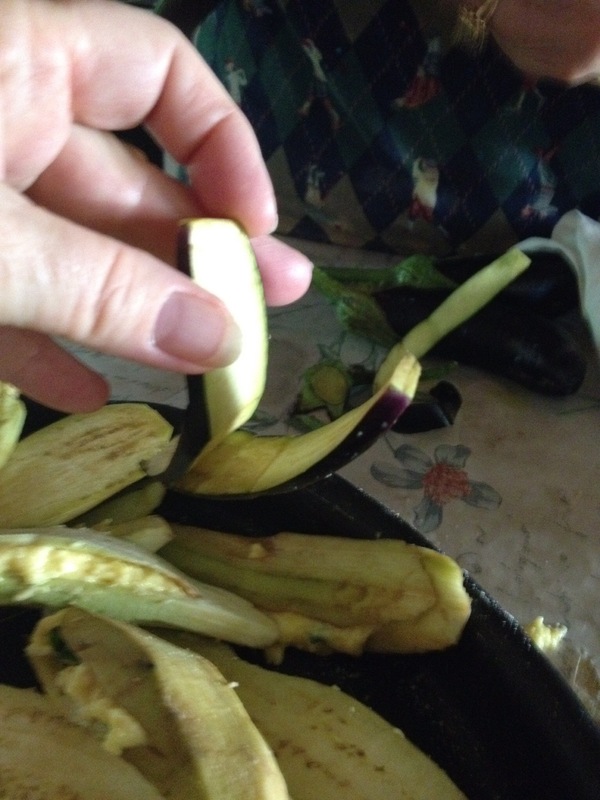 Melanzana – eggplant – is one of my “go to” comfort foods. All of you arm chair psychologists will opine that I’m having this mirage – that includes scent – to get me out of my doldrums. When the eggplants were in season in Pontelandolfo every home was chock full of the black-purple wonders. 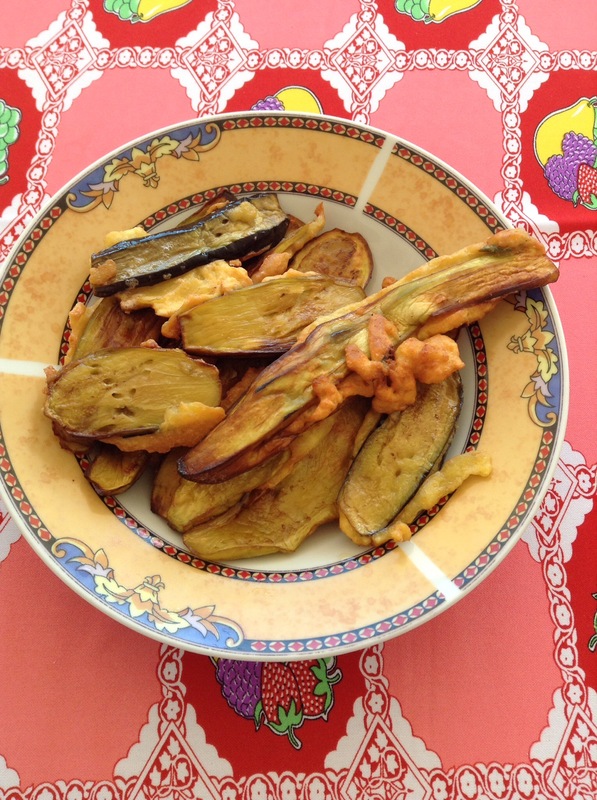 With a basket of them sitting on my kitchen table and my brain directing Sean Connery in a romantic comedy instead of focusing on eggplant – though it was one eggplant that made me thing of Connery – I hadn’t come up with a recipe. Then the angel of cooking appeared with what looked like a hot panini and said assaggiarlo – taste it. I did. I let the soft flesh of the melanzana coupled with the great salty cream of a local sheep milk cheese roll around all the taste buds of my tongue. It was wonderful. Think grilled cheese without the bread! I followed my cooking muse out to the work kitchen near her gardens. Peel only two sides of the eggplant. Buccia pieno di vitamine. The skin is full of vitamins. Then make three or four really thick slices with the buccia on the outside of the slice. It is the crust of our eggplant bread. The slices need to be thick enough to partially split in half. Leave a “hinge” at the bottom. When I slice a pita bread I also leave a closed bottom so the goodies don’t leak out. Vittoria uses a simple filing of fresh basil, eggs and sheep’s milk cheese. She thick grated the cheese – which was fairly soft or new cheese. Tons of cheese were added to 6 whipped eggs. She tossed in a pinch of flour and chopped basil. The mixture looks like lumpy cream cheese when it is stirred and melded together. It does not drip! It is super thick. You can see it in the above photo. Finally fry both sides of the eggplant sandwhich in olive oil and keep Midge out of the kitchen or they will all be gone and you won’t have any to freeze. Did she say freeze? 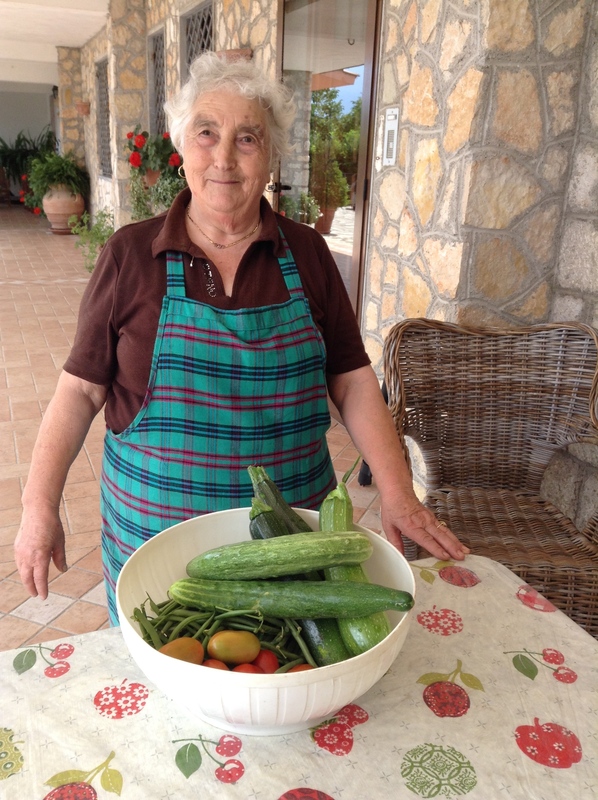 Many families in Pontelandolfo conserve their fresh products either by canning, drying or freezing. Zia Vittoria has a chest freezer that is always crammed full at the end of the summer. I like to eat the stuffed eggplant literally like a sandwich. She puts then in aluminum pans and covers them with what she calls sughetto and freezes them. They will be brought out in the winter, baked and eaten like – you guessed it – a vegetarian lasagna! Her sughetto is simply chopped tomatoes sautéed in olive oil with a smattering of salt and pepper. Hmmmmmmmm. I can still smell them frying. What’s that? You want my ticket? Oh that’s right I’m on the train to Milan. Next summer I will be back and so will the eggplant grilled cheese sandwiches.